The weather continued to be extremely hot and Tuesday evening was worse than ever. That made me crave once again some ceviche and as luck would have it, I had discovered a site where I could make reservations to various restaurants and get a discount. 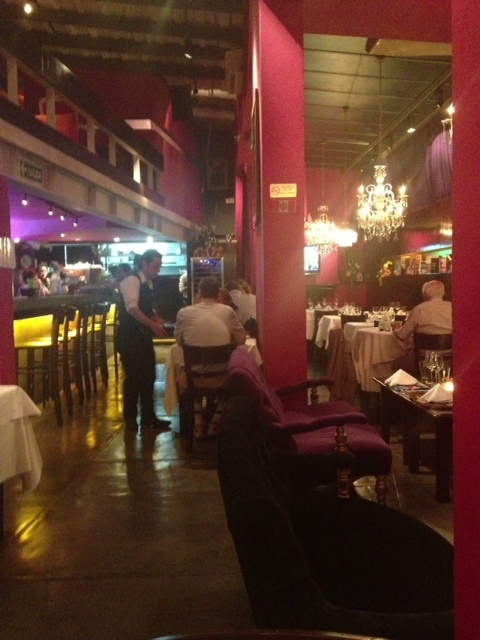 I had heard good things about a Peruvian place called Bardot and with a 20% discount, it seemed to be a good choice. Living up to its namesake, the interior of the restaurant was very French boudoir chic, with plush couches, chandeliers and dark red colors. It seemed slightly at odds with the Peruvian menu but whatever works I guess. 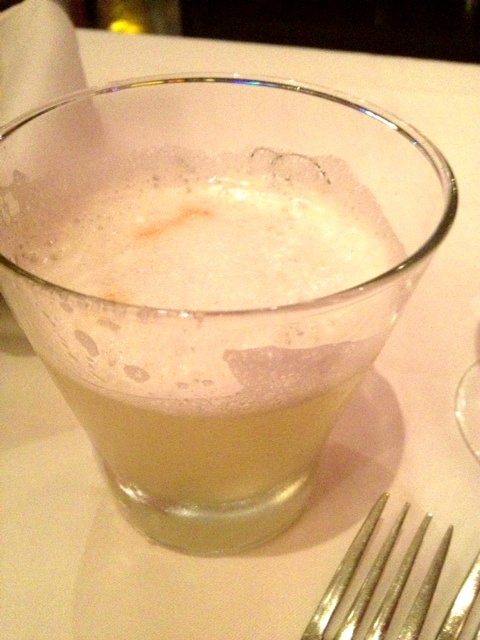 I had been craving a nice, cold pisco sour and the one here hit the spot. Nicely chilled, with the perfect balance of the strong pisco offset by the fresh lime juice and the whipped egg whites added the foamy goodness that is key in a good pisco sour. It gave me hope that I was going to get some good authentic Peruvian food. The ceviche list was pretty extensive but I decided to let my server, who was from northern Peru, to recommend the one he likes. 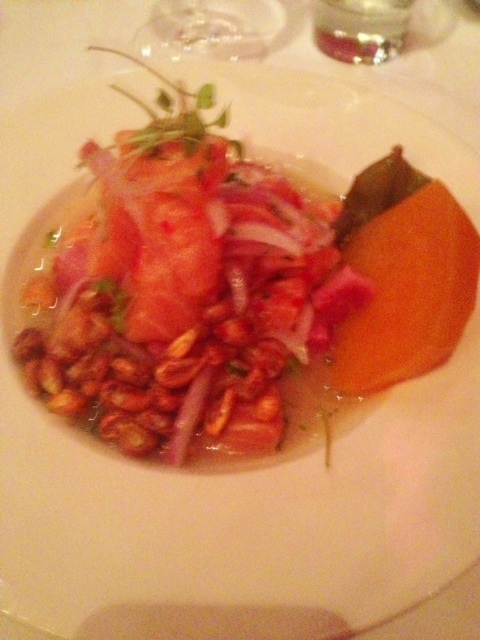 He smiled and pointed to the Amazon salmon ceviche. As I read the ingredients, I saw the usual items – fish (in this case salmon), leche de tigre, sweet potatoes – but then it got…different. Smoked bacon and maize – whaaa? He explained the bacon and maize were often added to ceviches in the Amazon. I was intrigued to see if this could possibly work, so why not? The salmon was thick but buttery smooth, with the leche del tigre adding the acidic punch. The peppers and red onions were thankfully subdued and the sweet potato was nicely prepared. Amazingly, the bacon and the maize really worked, adding a smokey undernote to all of the acid in the rest of the dish. I would have never expected this to be as harmonious as it was but very glad I decided to take the risk. 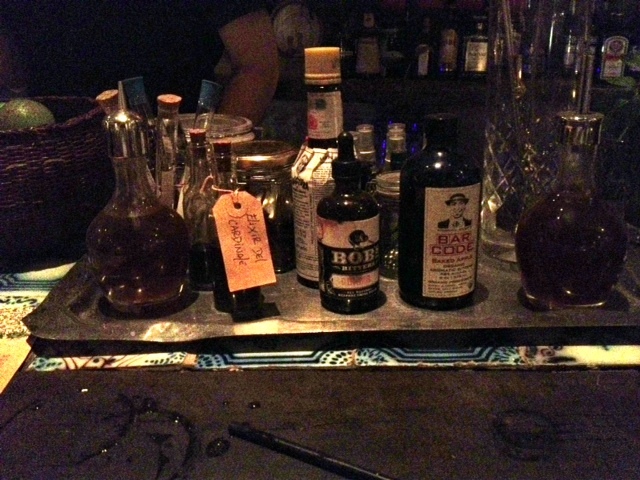 Bardot was only a couple of blocks from the great bar Rey de Copas so I headed there next. Since I was only drinking this time, I chose a seat at the bar and chatted with the very cool Martin, the main bartender for the evening. Jamiroquai was playing in the background and the place while not exactly full, had a very friendly vibe. I sat right in front of Martin’s laboratory of ingredients, ranging from perfumes of different scents to various droppers and all of the usual toys high end mixologists covet. This time I decided to start with the botanic smash, which I had made a mental note to try. 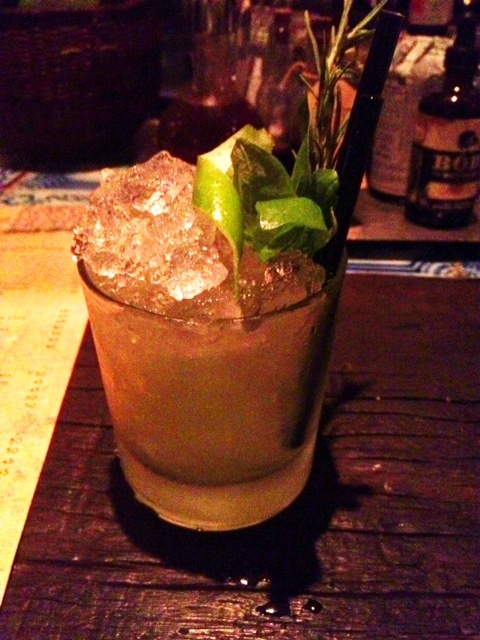 The drink included Bombay Sapphire gin, Ricard, lime, mint, basil and a smash of rosemary. The herbaceous flavors came through nicely and the mix of the floral gin with the slightly bitter Ricard made for a very well balanced drink. Given that I had already been mixing my liquors – pisco, wine and now gin, I thought it might be wise to stick with another gin cocktail. While I’m not a tonic fan at all, Martin told me about this Argentine tonic called 1748 that he claimed wasn’t nearly as bitter. 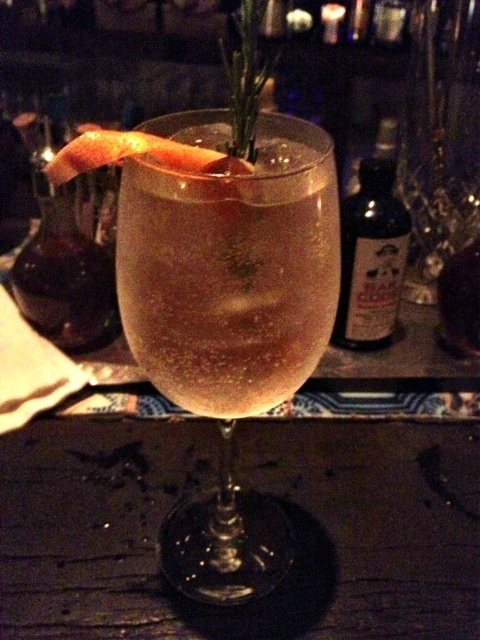 He suggested the botanic gin and since I was already in a herb mood (so to speak) it sounded like a good idea. This one took a bit longer to make, with Martin chilling a wine glass (interesting) and then adding/stirring the various ingredients until this was presented to me. Yikes. Martin explained that gin and tonic in a wine glass was a very Spanish thing (news to me but OK.) I was bit leery of such a large drink given my distaste for tonic but when in Rome, er Buenos Aires… The botanic elements, which this time included thyme, rosemary, mint and basil, help temper the bitterness of the tonic but also as he had noted, the tonic itself wasn’t too harsh. The twist of grapefruit was a nice touch too. I sipped on my monster cocktail and chatted up a woman who turned out to be an ex Pat from LA. She was having a pre-cocktail before heading over to an after party for the band Grizzly Bear at this private club near there. We talked about portenos vs. portenas and about our respective experiences. She took off to her shindig and given it was 2AM on a Tues, I thought it might be a good idea to go home. Posted on February 1, 2013 by reyalto. Bookmark the permalink.